The Czech car manufacturer, Skoda India has stopped the production of its hatchback, Fabia in India. Skoda, from now stopped assembling the kits for Fabia in India however the company will continue selling the car till the stocks last. The car manufacturer has been suffering huge loses on Fabia since a long time now and was in discussion with the manufacturer to stop the production. According to industry sources, Skoda was losing as much as Rs 1.5 lakh per car and hence the company was deliberately refraining from aggressively marketing the Fabia which sold a meagre 3,343 units in the 2012-2013 fiscal year. Last month Skoda sold a paltry 115 units. Earlier this year, Honda withdrew its premium hatchback the Jazz, for similar reasons as the car was just too expensive to produce. 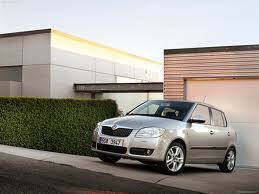 Skoda is unlikely to launch Fabia hatchback in India before 2015 and till then no replacement of the car is provided. However, the company is betting big on the new Octavia which Skoda hopes will become the segment leader after its launch this August. “We can re-deploy our resources from the unprofitable Fabia towards brand building for our other products and dealer network expansion” said a company official.